This book is published in collaboration with the Lake St. Louis Historical Society and the 78th Fraser Highlanders. Click here to visit the 78th Fraser Highlanders website. 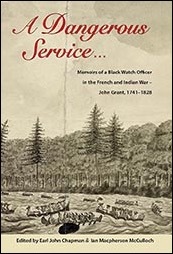 John Grant’s eyewitness accounts of military life during the French and Indian War provide fascinating and invaluable insights into the period. We follow the young Scottish officer to the Caribbean, where he soldiered in the disease-ridden cane fields and swamps of Martinique and Guadeloupe, and later at the siege of Havana, and to North America, where he served at Staten Island, New York and on the Hudson River route to ­Ticonderoga and points north. He worked on building forts at Oswego and Crown Point and was part of John Bradstreet’s famous “Battoe Service” making the movement of armies and supplies through the wilderness possible. With General Jeffery Amherst’s force, he survived shooting the treacherous rapids of the St. Lawrence River to capture Montreal in 1760, completing the British conquest of New France. Not only does Grant describe the physical conditions of the fighting and the strange environments encountered, but we learn first-hand of the Highland soldier’s ­emotions before and after combat, his will to fight, and, most of all, his perseverance in adversity. The Black Watch’s exploits in the Americas during Britain’s “Great War for Empire” were a critical factor in changing the image of Highlanders in British society from Jacobite rebels to Imperial heroes. Here in Grant’s memoirs we find a veteran of Britain’s first “American Army” whose career straddled that remarkable transformation. Proud of his family, countrymen and regiment, John Grant pursued a shining career while on “a dangerous service” as a young Black Watch ­officer that marked him for the rest of his life. “Here is something fresh and original – a rare, authentic ‘voice’ of a soldier from the mid-eighteenth century. It offers unique personal insights reflecting the reality of campaign life and combat, both often recalled with a certain self-­deprecating humour. Starting with his earliest, fragmented memories of a childhood disrupted by the Jacobite rebellion of the ’45, Grant recounts his service as a subaltern in the 2nd Battalion of the 42nd Foot, the famous Royal Highland Regiment or ‘Black Watch,’ from his first taste of action at Guadeloupe in 1759 to the siege of Havana in 1762.” Dr. ­Stephen Brumwell, award-winning historian and author of George Washington: Gentleman Warrior and Redcoats. “Students of the French and Indian War will find much of interest in Lieutenant Grant’s previously unpublished account of his service with the Black Watch in the West Indian and North American theatres; and, by turns, will be fascinated, enlightened and finally charmed by Chapman and McCulloch’s thoroughly researched biography of the officer-memoirist.” Dr. John A. Houlding, author of Fit for Service: The Training of the British Army 1715-1795. “What a remarkable and complicated book! Fully attentive to multi-generational Scottish clan connections, the editors unravel John Grant’s service in two wars in North America … and his fraught service in the Caribbean.” Nicholas Westbrook, Director Emeritus, Fort Ticonderoga. Click for printable full description in pdf.